WASHINGTON (CNS) — Four nationally circulated Catholic publications called for abolishing the death penalty in the United States in a jointly published editorial. America, National Catholic Register, National Catholic Reporter and Our Sunday Visitor urged their readers, the U.S. Catholic community and people of faith to “stand with us and say, ‘Capital punishment must end,'” the editorial stated. The editorial was published online March 5 by each publication and was to appear in the printed versions of each journal in the coming weeks. Dennis Coday, editor of National Catholic Reporter, said the effort evolved after the U.S. Supreme Court agreed in January to hear arguments in an Oklahoma death penalty case. The case, Glossip v. Gross, involves the use of a lethal-injection protocol widely used across the country that resulted in three botched executions in 2014. The Supreme Court is expected to decide the constitutionality of lethal-injection executions in Oklahoma by the end of its term in June. 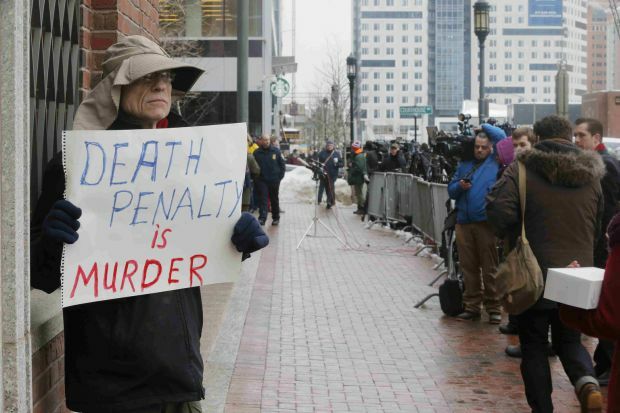 “Our hope is that (the court) will hasten the end of the death penalty in the United States,” the editorial said. Coday cited a statement from Archbishop Paul S. Coakley of Oklahoma City after the failed execution in April of Clayton Lockett, for driving the desire among the editors to develop the joint editorial. Lockett writhed in pain for more than 40 minutes after being injected with a deadly cocktail of chemicals before dying of apparent heart failure. With the Supreme Court agreeing Jan. 23 to hear arguments in Glossip v. Gross, the editors of the four publications agreed to tackle the death penalty in a joint editorial, Coday explained. Other editors said the cooperative effort demonstrates the unity across the Catholic Church to end capital punishment. “The unity among Catholics in defense of life can send a powerful message,” Jeanette De Melo, editor in chief of National Catholic Register, told CNS. “This is an issue that we can find unity with our colleagues in the Catholic press. That’s why we chose to do this in a joint statement. De Melo decried the rising assault on human life through abortion, euthanasia and war in addition to capital punishment. “Even though they are of different moral weight, they all threaten human dignity and we must work to end them,” she said. The editorial was translated into Italian and appeared in the March 6 edition of L’Osservatore Romano, the Vatican newspaper. Comments from Archbishop Thomas G. Wenski of Miami, chairman of the U.S. bishops’ Committee on Domestic Justice and Human Development, and Cardinal Sean O’Malley of Boston, chairman of the bishops’ Pro-Life Activities Committee, welcoming the Supreme Court’s decision to hear the Oklahoma case were cited in the editorial. In addition, it quoted Philadelphia Archbishop Charles J. Chaput, who commended Pennsylvania Gov. Tom Wolf for declaring a moratorium on the death penalty when he assumed office in January. “Archbishop Chaput reminds us that when considering the death penalty, we cannot forget that it is we, acting through our government, who are the moral agents in an execution. The prisoner has committed his crime and has answered for it in this life just as he shall answer for it before God. But it is the government, acting in our name, that orders and perpetrates lethal injection. It is we who add to, instead of heal, the violence,” the editorial said. “We join our bishops in hoping the court will reach the conclusion that it is time for our nation to embody its commitment to the right to life by abolishing the death penalty once and for all,” the editorial concluded.